Last Sunday as a birthday treat, I went with my sister & husband to see the gardens of Petersham House, where the owners of Petersham Nurseries. It is a stunning Georgian house and exquisite gardens next to the nurseries and they open the gardens to the public twic a year. After a walk around the gardens we had lunch in the formal restaurant in the nurseries. We entered the gardens from the nurseries where you walk through the kitchen garden for the restaurant which also includes flowers they grow for decorating the restaurant, shop and glass houses. The house has that wonderful Georgian symmetry which is enhanced by the addition of a pavilion on the left and a conservatory on the right. Of course we had to press our faces to the windows of both these buildings and peer inside! The house is next to the church whose spire can be seen from every part of the walled garden. The large expanse of lawn in front of the house has beautiful iron gates that lead into another section of the garden. The lawn is dotted with topiary and a statue which is called the silent statue. The flower beds around the lawn were full of pops of late summer colour. There are some interesting benches in the garden where you can sit and contemplate the beauty around you. Passing through the tall iron gates you walk down a long path with flower borders which are still full of colour despite being late September. Lots of textures and shapes make these borders interesting. The long swimming pool looked so inviting especially as the water was lovely and warm! Even the sheds were beautiful ! The huge fig trees along the wall were still covered in fruit and I'm sure the baked figs I had for dessert in the restaurant today came from that tree. Lots of lovely dappled light in the shadier areas. After an hour wandering this beautiful garden we walked through the nurseries to the restaurant where we enjoyed a leisurely lunch - fabulous food and wine !! A wonderful day and birthday treat! I highly recommend you go and see the gardens of Petersham House next time they are open to the public (they open them twice a year). Have any of you already been to see the gardens? Would love to hear what you thought of them. A couple of weeks ago a friend and I went to Charleston, the home of the Bloomsbury Group, to do a lampshade painting workshop with Cressida Bell who is the talented artist granddaughter of the artist Vanessa Bell and daughter of Quentin Bell. I wonder if you are as passionate about the Bloomsbury Group as I am? I devour books about them and have often visited Charleston, Berwick, Firle and Monk's House. 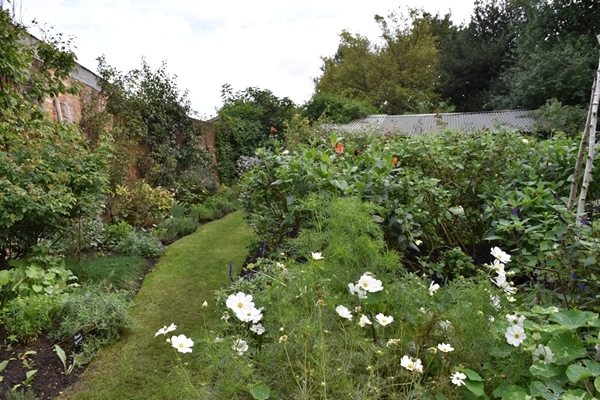 At the end of August I paid a visit to Sissinghurst Castle Garden. This was my second visit to Sissinghurst (I went a couple of years ago) and it is one of those places that you could visit two or three times a year and always see something new.